In a curious promo, Egyptian pyramids are being used as an art element by cheerleaders for TelexFree, an alleged pyramid scheme. Source: ConventionTelexFree.com. Red highlight by PP Blog. U.S.-based TelexFree, alleged in Brazil to be a massive pyramid scheme, is serving up a heaping helping of strangeness. For starters, a promo for TelexFree’s International Convention set for Spain next month is being voiced by Sann Rogrigues, whom the SEC successfully sued in 2006 amid allegations he was operating a pyramid scheme and engaging in affinity fraud aimed at the Brazilian community. The promo curiously is playing against the backdrop of an image of the Pyramids of Giza. For good measure, images of other famous world landmarks are thrown in. These include St. Basil’s Cathedral (near the Kremlin) in Moscow; Big Ben in London; The Eiffel Tower in Paris; the Empire State Building and the Statue of Liberty in New York; the Leaning Tower of Pisa; and the Burj al Arab Hotel in Dubai. TelexFree operates out of Marlborough, Mass., and Las Vegas in the United States. Its convention is scheduled for March 1 and 2 in Madrid. The promo in which Rogrigues dispenses the TelexFree convention wisdom appears on a website styled ConventionTelexFree.com. Among the claims on the site is that American MLM lawyer Gerald P. Nehra will be among the “Special Guests” at the rah-rah fest in Spain. 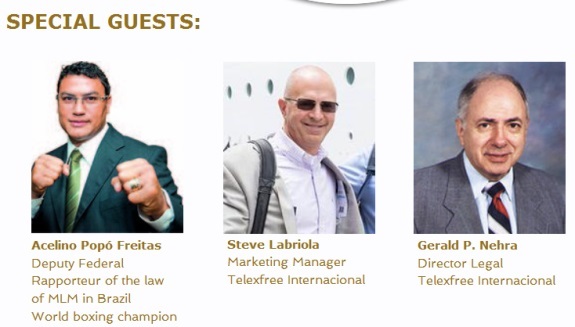 American MLM lawyer Gerald Nehra will be a special guest at TelexFree’s International Convention in Madrid next month, according to ConventionTelexFree.com. Serving as an expert witness for AdSurfDaily in 2008, Nehra opined that ASD was not a Ponzi scheme. ASD operator Andy Bowdoin, now serving 78 months in federal prison at the age of 79, later disagreed with his own expert. In 2012, Bowdoin admitted that ASD was a Ponzi scheme that had gathered $119 million and said the “program” never operated lawfully from its inception in 2006. ASD promoted a return of 1 percent a day. Some TelexFree promoters say that “program” triples or quadruples money in a year. Some promos solicit sums of $15,125. Nehra’s law firm also was touted by Zeek Rewards. In 2012, Zeek was accused by the SEC of operating a massive international Ponzi- and pyramid scheme that gathered hundreds of millions of dollars by planting the seed that returns would average 1.5 percent a day. At least two Zeek figures potentially now face prison sentences after pleading guilty for their roles in the scheme. The court-appointed receiver in the Zeek case says he’s on the brink of filing lawsuits against thousands of Zeek promoters. 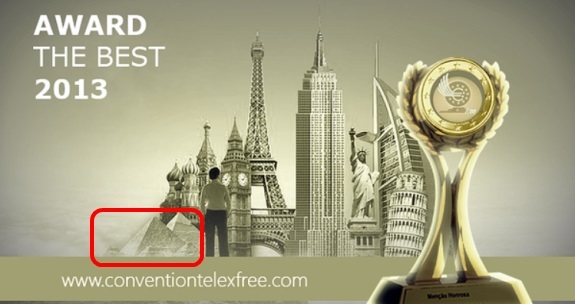 TelexFree appears recently to have begun operating under the name TelexFree International. Precisely where TelexFree International is based is unclear. In the past, Nehra has described himself an an attorney for “TelexFREE in the USA,” according to BehindMLM.com. Whether he represents the TelexFree International derivative is unclear. Convention promoters, however, appear to believe he does. Gerald Nehra? I thought there was a glimmer of hope until I saw his name. The omens are not good. Labeled as “Director, Marketing” instead of “Marketing Manager”. Faith Sloan is helpfully labeled as “Faith Sloan”. In the smaller picture, Sann Rogrigues (labeled “1st Millionaire”) is keeping the same interesting company. That background is clip art. I’ve seen TVI Express use that picture before. I thought Brazil doesn’t have laws specifically for MLM? Need to investigate. K. Chang: That background is clip art. I’ve seen TVI Express use that picture before. Are you talking about the picture with the gold trophy in the foreground and the world landmarks in the background? Did TVI Express use that photo? So, X number of people might have joined TelexFree believing the payback had been eliminated — when it had not been eliminated. It’s also pretty clear that there is Zeek and Profitable Sunrise money in TelexFree. Hell, there could be ASD money in TelexFree. It’s as though Zeek and Fortune Hi-Tech never happened.